I am having issues with the Earl Grey madeleines. I know my oven is hot and I compensate for that and use a thermometer. I just haven't gotten around to adjusting the dial, but 400 degrees for 12 minutes seems way too hot for much too long. I made a batch last night and overcooked them because I forgot about the overcooking issue. I turned the oven down to 325 and 6-8 minutes seems to be plenty. These are the large shiny pans placed int he center of the oven. I am putting about 1 tbsp of batter in each. I checked Baking with Julia and Roland Mesnier and they seem to be using high temps as well (400 and 425), but they use only sugar. I think the honey in Dorie's recipe makes them brown much more quickly. Now, I'm no pastry chef but most recipes I've seen that are 2-9" round cake pans will be easily converted into 1-9"x13" pan. Dorie's carrot cake recipe is 3-9" pans so you'll probably have some extra batter to make a few cupcakes with. I wouldn't try to fit all of the batter into your 9"x13" pan or you'll have a mess on the bottom of your oven! just made the French Yogurt cake--this is as fast as making a box cake!! I really had it mixed up and in the oven in 5 minutes. You may have passed it over because it looks so simple, but it is really delicious--I've only eaten a crumb as it's still cooling, but it's light and has a very different texture from an American tea bread--it tastes very eggy, and is not too sweet--I'm going to glaze it with lavender syrup as I only have a teeny bit of homemade marmalade left and don't want to use it up for a glaze. I'm so glad that you tried the French Yogurt cake. Now, with your endorsement, I'll go ahead and do that one next. I made the Cottage Cheese Puffs last night. I thought I would bring them to work today. Well after sampling by both my son ans I nothing came to work. They were so good. I used black raspberry jam. You have to chill the dough, but it's really fast to put together. I think tonight I will put some more together and make up more of these tomorrow. Definitely a keeper recipe. I am making the Chocolate Caramel Chestnut cake today. I do not have any brandy for the soak plus I do not usually like liqueury soaks. I thought I would sub the caramel syrup soak from Pierre Herme's Pave cake. Any thoughts? Becca, I hope you can post a photo when it's done. I adore chestnuts and caramel-chocolate cake is divine. I can only imagine the combination of the two. I've just made a few things from or adapted from this book and they both turned out wonderful. 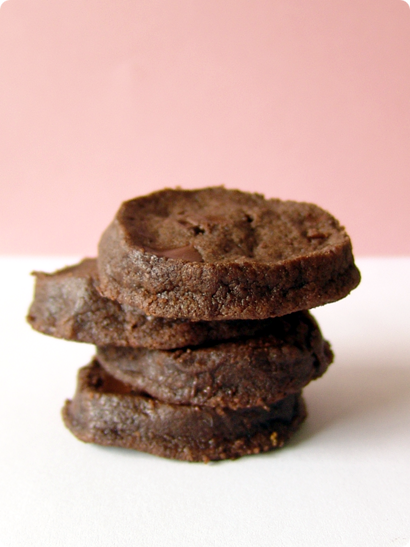 The first thing is Pierre Hermé's chocolate and fleur de sel cookies otherwise known as world peace cookies. 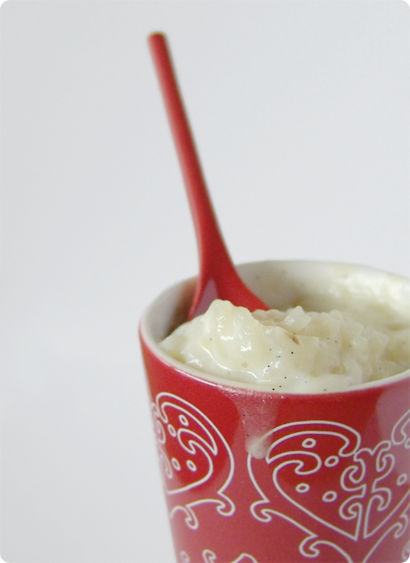 I've also made riz au lait. Didn't use Dorie recipe though. But her technique (= parboiling the rice for 10 minutes) gives such an outstanding result: not too starchy yet creamy. So thanks Dorie for the lovely recipes and great tips. 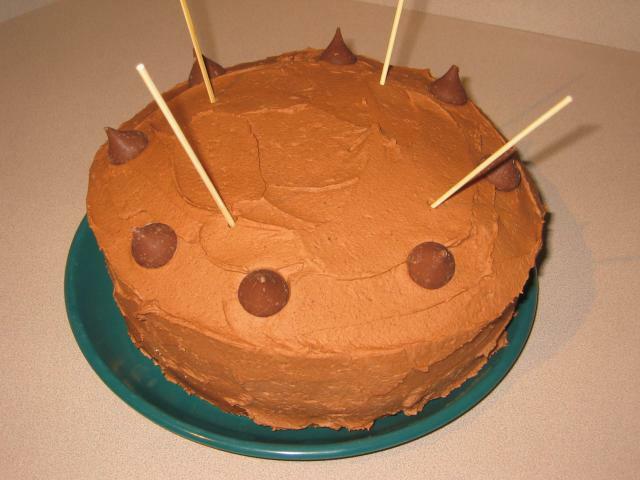 I made the cocoa buttermilk birthday cake (p.256) this week. It tasted divine...almost like a brownie. 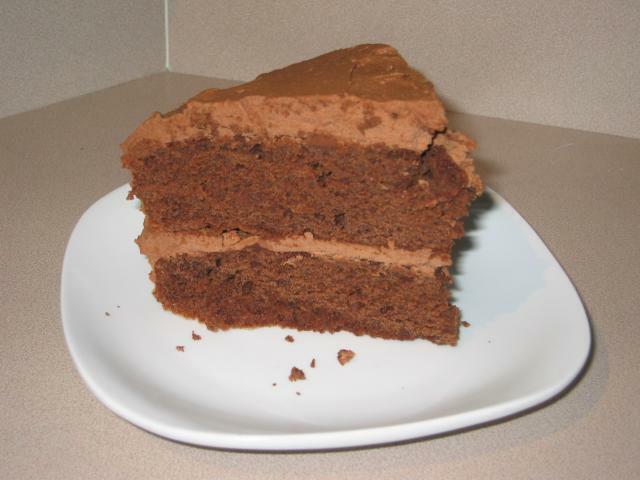 The recipe for the chocolate malt buttercream made a generous amount of icing which fully covered the cake and even had a little left over to snack on. Now I love sugar but this--even for me--is a very sweet/rich cake and buttercream recipe. Anyone who can't handle this amount of sugar, beware. I think all total there's about 4-4 1/2 cups of sugar in this cake. This isn't including the sugar that's in the chocolate! Please ignore the wooden squewers poking out of my cake. Along with cling wrap, that's how I cover my cakes for transport. I really should invest in some sort of cake dome, shouldn't I? Has anybody had issues with baking Korova cookies from frozen dough? They are fine when I bake them off the same day I make the dough, but they aren't very sable like from frozen dough. They spread tooooo much and on several occasions turned into tuile-like things--including the one time they turned into one big giant flat cookie thing covering the entire pan. I've been meaning to make the far breton for a while now and finally got around to it. It was so wonderful! We finished it off so fast that I turned around and made another one. Easy and oh-so-pleasing. I haven't done much baking since Christmas. Yesterday, though I made the Katherine Hepburn brownies. They were rich, gooey and very chocolatey. Loved them. I also tried the vanilla ice cream, and did the chocolate chip mint variation. This was a lovely, rich, creamy ice cream. It went well with the brownies. I've always had much more success with sorbets than ice cream when using my cuisinart icecream maker. This base recipe was a great success and gives me confidence to try more variations. I've had that problem, but I realized it was because I was cutting them too thinly. I think I was cutting them to about 1 cm, but they really should be a bit thicker than that. It may also have been because of the heat of my oven. Although the temperature is accurate, I have a very small convection oven, so I found that decreasing the temp. by about 10C helped, too. I made the carrot cake in the 9x13 pan. All the batter fit in the pan no problem. It was served at our local carnival supper to rave reviews. I was full and didn't have a piece. I cannot wait to get this book. I ordered it based on a freebie recipe for Classic Brownies in a TheGoodCook.com mailer. Best brownies I've ever eaten. Don't know if they're the same as the 'bittersweet brownies' that some other posters have written about, but the recipe does call for espresso powder (which I didn't use only because I didn't have it) and lining the pan with foil. I love these. Used all Scharffenberger and I won't use espresso powder next time because they're so perfect as is. Thank you to all of you for sharing your amazing photos. I know I'm entering this conversation rather late, but I just joined egullet. I have a few general comments about the book and will also comment on some of the recipes. First, this book completely energized me. The day I bought it, I broke out a small post-it pad to start marking recipes I wanted to try and quickly found it a useless strategy since I was marking about every third recipe. I love that there are so many recipes that are not overly sweet, that use ingredients I love like cornmeal, prunes, pears, nuts. The book serves as a lovely reminder that baked goods need not be giant productions. The Brown Sugar Bundt Cake--WOW!! I've made this four times I think. I make a slight change to it though, combining the main recipe with the nut recipe. Basically, I follow the nut recipe but I keep the pears in. The pears and the hazelnuts work wonderfully together. This cake has been a huge hit each time I made it. I think folks will likely start requesting it of me. I have been meaning to try some of the other bundt cakes but can't seem to get off of this page. Cornmeal Maple Drop Biscuits: This was the first of the breakfast recipes I made. They came together almost ridiculously easily, and everyone loved them. I served them with a maple butter. They made me realize that I could put together baked goods in the morning and still get off to work on time. That's a great gift, Dorie! Great Grains Muffins: WOW. These were incredible. I made them on Christmas Eve morning when my niece and nephew woke me up at 6:00 am because they wanted to bake. They picked out the recipe, and they did more than half of the work. This is yet another recipe that comes together easily. They tasted great, had a great crumb. My 8 year old quite healthy nephew ate 4 of them that morning. He reluctantly held two in reserve for his grandparents (this would have been a tougher sell if not for the pride he felt in having made them). Cornmeal and fruit loaf: Another quick one to put together. I used pears rather than apples. This was meant to go into the office but never made it out of the kitchen. Honey brownies: Wonderfully moist, great unique flavor, but next time I'll use a more distinct honey. Chunky PB and Oatmeal Chocolate chipsters: We made these late in the evening prior to the great grain muffins early morning wake-up. My nephew did a wonderful job forming the cookies. Everyone loved these when they came out of the oven. The next day I found them to be too crisp without a cup of hot tea to dunk them in. Others still liked them. I think we likely over cooked them a bit. I'll make them again (in fact, fighting the urge to bake them tonight). Chocolate oatmeal drops: My first sort of miss in the book. I had less chocolate than I thought, so used only 6 ounces. That didn't seem to be a problem. Instead, I found it to be a very thin "dough". Really, it seemed more a batter to me. There was no way to make drops from this. Instead, I dumped it all into a jellyroll pan and made bar cookies. They were good, though a little dry (possibly the lesser amt of chocolate, possibly overcooked). I want to thank Dorie for putting together such a motivating book. It so successfully encouraged this relatively novice baker. Also, thanks to all of you who have posted your photos and descriptions! I made the Katharine Hepburn brownies the other day. I used slightly more instant coffee than called for (my instant coffee was very chunky, not fine, so I thought I should use a bit more). I loved the texture, but I thought the brownies were OK. Admittedly, I'm not a huge chocolate fan so that probably tempered my reaction to them. My co-workers, however, loved them. Save a few tiny slices at home, they were devoured. After reading people's comments on other recipes, I wish I had just brought the whole book back with me. I bought it when I was in Canada in December, and just copied some recipes I wanted to try. I may have to bring it back with me next summer! Help - need advice, please! I have all my ingredients measured and/or weighed for the Applesauce Spice Bars, the oven is heated and I've even melted the butter - I just realized that I don't have the right size pan. I've got a 9x9 baking pan and I have a 9x13 All-Clad roasting pan. Everything else is springform rounds or quiche pans. Should I put everything on hold until I can buy the right size pan? Or can I do something with what I have? I'd use the roasting pan, I think. I've got a couple bananas sitting on my counter just begging to be baked up this weekend. Should I make the choco-nana bread? Or the black and white banana loaf? Any recommendations from those who've tried these two recipes? Emmalish, I've made both recipes and I preferred the black and white banana loaf over the cocoa-nana loaf. If you have 4 bananas, I'd try the classic banana bundt cake....that was, by far, my favourite banana recipe by Dorie. Unfortunately I've only got the two bananas right now. Thanks for the rec for the bundt cake tho – I'll have to buy more bananas this weekend and try it out later. And thanks for the vote for the black & white loaf. Eventually I will try them both, but like I said, I've only got the two bananas right now, so a choice must be made. The Banana Bundt was amazing...even after three days on the counter wrapped in tinfoil, it's perfectly moist and delicious and I think I overbaked it quite a bit, so for me, that's an automatic home run recipe because I am a chronic overbaker. Reading the thread made me want to bake a banana cake, but I'm in worse shape than emmalish -- I've only got 1 banana! I walked into the kitchen just in time to see our son take the last bite of the second banana! I'm glad you like the banana bundt Badiane -- so do I! It's what I would make if I had more bananas or the oomph to go out shopping. Looks like it's going to wait until the weekend.